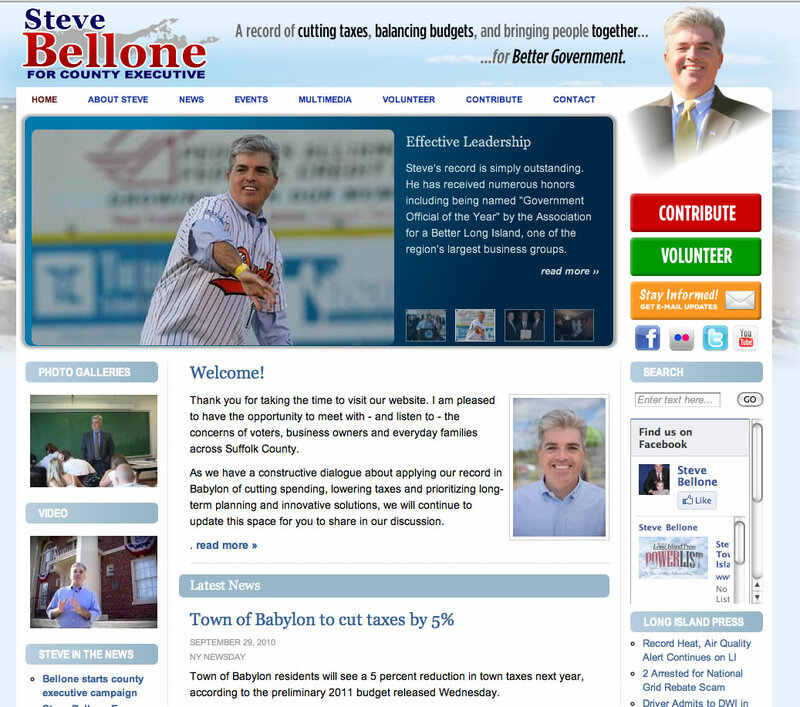 NOTE: January, 2013 - SteveBellone.com is now part of the Suffolk County Democrats CommuniTree system. To find out more about CommuniTree, click here. As an off-year when it comes to federal elections, many people expected that 2011 would be relatively sedate, with only lower-profile local elections taking place. Not so on Long Island. A hotbed of Tea Party activism, neighboring Nassau County first sounded the alarm in 2009 in the election for County Executive, with Republican Ed Mangano narrowly defeating heavily-favored Democrat Tom Suozzi. Needless to say, the Suffolk County race for County Executive is being closely watched as a possible early indication of how the chips will fall nationwide in 2012. Steve Bellone is an exciting and up-and-coming Democrat who has done great things as Babylon Town Supervisor - promoting Green initiatives and streamlining local government, while cutting property taxes by 5%. InterCreative was thrilled when the campaign reached out to us to do both the campaign logo and his campaign site. With a bright, airy design that's in keeping with the natural character of the area, InterCreative created a look that's visually appealing, while affording multiple access points for engagement. We're very excited to be working with the campaign and things are looking good for November... for now, we say, "Go, Steve!" Postscript: Steve won the race handily and is a rising star in Democratic politics.